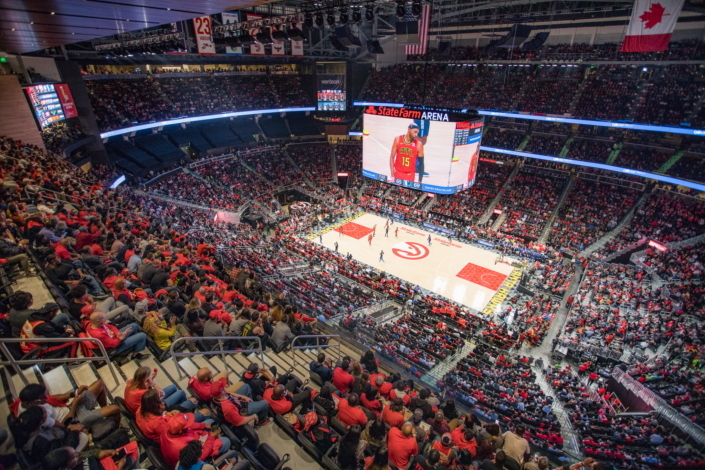 As basketball fans are gearing up for the start of the 2018-2019 NBA season, the Atlanta Hawks already have something to be proud of: a newly renovated, world-class arena. The new State Farm Arena, which underwent the second-largest renovation in NBA history, held an open-house event on October 20 that welcomed approximately 10,000 people. More than 12,000 square feet of Samsung SMART LED signage been installed throughout the arena, combining to offer 10 times more LED video than the previous configuration. The main, center-hung video board is not only the NBA’s first 360-degree, continuous video screen, it’s also the first arena bowl to feature HD-quality, 6mm LED video display technology. The center-hung videoboard includes a massive 4,477 square feet of high-definition video display, offering true-to-life colors and dynamic details. Whether seated courtside or in the upper deck, fans will catch every bit of the action on the floor. The center-hung structure that holds the high-resolution, 6mm pixel pitch display features two additional displays mounted in its interior. Measuring 20 feet wide by 9 feet high, these displays offer an additional 360 square feet of active video viewing area. More than 20 LED displays have been installed throughout the arena, for a total of 12,047 square feet of LED video. With more than 30.42 million individual LED pixels, these displays deliver crisp, clear content throughout the arena. Incorporating these displays ensures that this iconic venue is well positioned to keep up with the rapidly evolving sports entertainment industry. 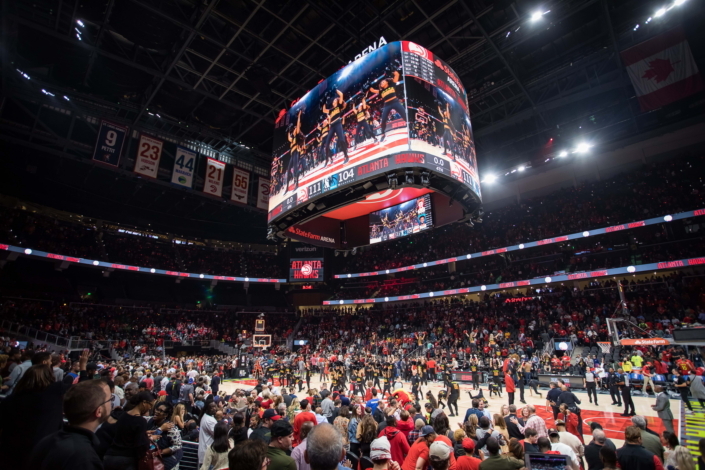 “We are pleased that NBA fans can enjoy a vibrant viewing environment via our Smart LED signage technology,” said Seog-gi Kim, Executive Vice President of Visual Display Business at Samsung Electronics. 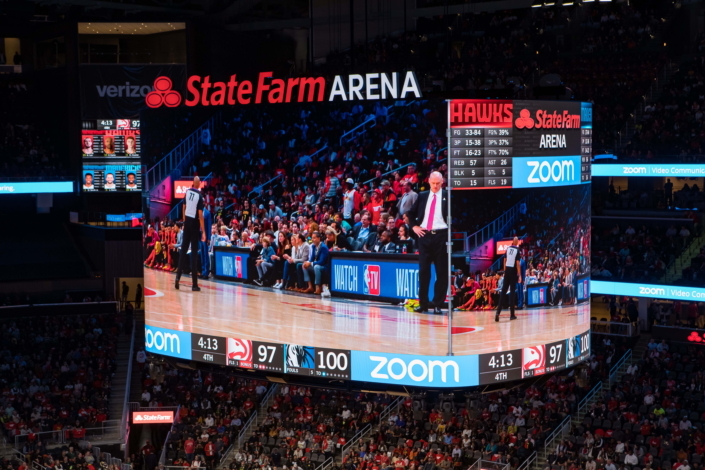 The Hawks joined forces with Samsung to up the ante when it comes to the fan experience. 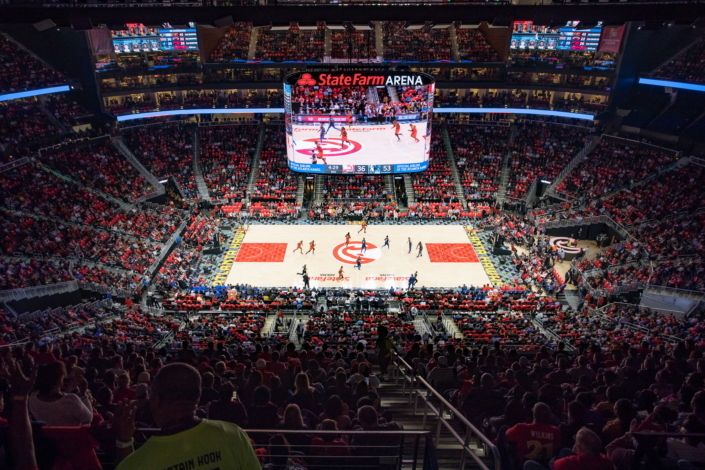 Throughout the design process, Hawks officials worked closely with Samsung, and came to the decision to have four corner boards and a center-hung board. As the number one leader in the global signage market for nine consecutive years, Samsung is widely recognized as an innovator in LED signage—mastering the art of digital displays from design and engineering to manufacturing. Since its acquisition of Prismview in March 2015, Samsung has been providing its customers with truly groundbreaking LED signage solutions, customized to suit the needs of any venue. Not only that, Samsung LED signage is being installed in stadiums all over the world to communicate with spectators and promote brands. From Asia to North America, consumers are coming to expect a first-class viewing experience at live events that enhances their enjoyment. In particular, the Samsung LED signage at the National Stadium in Kuala Lumpur, Malaysia offers spectators at sporting events and pop concerts an enhanced fan experience. In Incheon, South Korea, baseball fans are tracking fly balls from SK Happy Dream Park (Munhak Baseball Stadium)’s electronic digital display—one of the worlds’ largest LED video displays. And at M&T Bank Stadium in Baltimore, Maryland, Ravens fans can watch the action on two massive endzone displays (measuring 201 feet wide by 36 feet high), as well as displays mounted on the upper and lower fascia, and four large video boards in each of corner of the upper deck. Samsung continues to break barriers through technological advancements, as well as make room to evolve to provide consumers with truly immersive viewing experiences.